Our franchise was started in 1994 by John M. Halko. He initially started as a very small, one man, one truck operation. Soon, the company developed into a much larger organization. John hired Matthew Balch and Jeremy Wolfe who started as technicians and eventually became the Operation Managers who currently take care of the day to day operations. Matt and Jeremy have been with our franchises for over 14 years each. They have gained certifications in Carpet Cleaning, Water Migitation, Fire Restoration, Mold Remediation, and Commercial Property Damage. They are truly knowledgeable in all of the aspects of the business and can answer any questions you may have about restoring or remediating your home or business. Our Office Manager has been with our company for over 8 years and has learned all aspects of working with insurance companies to ensure that coverage is approved to make our work as less stressful as possible following your loss. Know that when you call our franchises, you're getting the best customer service. If you have any questions, please give our office a call at 315-457-3432 to see how we can help you! 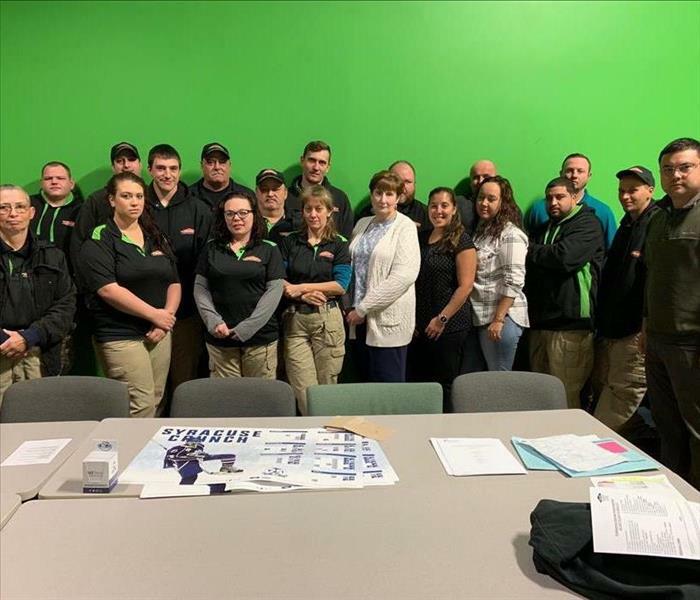 SERVPRO of North Onondaga County is locally owned and operated—so we’re a part of this community too. We are also part of a national network of over 1,700 Franchises, which enables us to respond quicker with more resources. For major storms and disasters, we can call upon special Disaster Recovery Teams strategically located throughout the country.